We live in the future don’t we? Is there a reason why only rich people have touchscreen controlled showers and temperature regulated bathtubs? [Raptor_Demon] shows us how to make our very own automated bathtub for cheap, using our favorite microprocessor — the Arduino. The system controls the filling of the tub, monitors the temperature based on a user profile — and it even adds bubbles. Why do you need this? You probably don’t — but why not, wouldn’t it be nice to press a button and have a bath drawn for you? It uses an Arduino compatible board that controls 3 relays for the water system, a DS18b20 temperature sensor on the inlet and a second wireless (434mhz) Arduino compatible board for monitoring the tub temperature and adding bubble bath using a hacked automated soap dispenser. [Raptor_Demon] showcased his prototype at the Maker Faire NC 2013 and 2014 where it was a huge hit. He even had a full size tub going, in which he would sit in during his explanation — check it out! [Patrick] has spent a lot of time around ground and aerial based autonomous robots, and over the last few years, he’s noticed a particular need for teams in robotics competitions to break through the ‘sensory bottleneck’ and get good data of the surrounding environment for navigational algorithms. The most well-funded teams in autonomous robotics competitions use LIDARs to scan the environment, but these are astonishingly expensive. With that, [Patrick] set out to create a cheaper solution. Early this year, [Patrick] learned of an extremely cheap LIDAR sensor. Now [Patrick] is building a robotics distance measurement unit based on this sensor. Early experiments with mechanically scanned LIDAR sensors centered around the XV-11 LIDAR, the distance sensor found in the Neato Robotics robot vacuum cleaner. [Patrick] became convinced a mechanically scanned LIDAR was the way forward when it came to distance measurement of autonomous robots. Now he’s making his own with an astonishingly inexpensive LIDAR sensor. 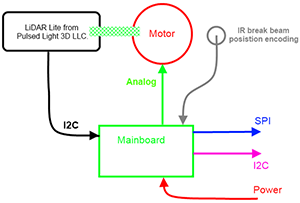 The basic idea of [Patrick]’s project is to take the PulsedLight LIDAR-Lite module, add a motor and processing board, and sell a complete unit that will output 360° of distance data to a robot’s main control system. The entire system should cost under $150 when finished; a boon to any students, teams, or hobbyists building an autonomous vehicle. [Patrick]’s system is based on the PulsedLight LIDAR – a device that’s not shipping yet – but the team behind the LIDAR-Lite says they should have everything ready by the end of the month, all the better, because between these two devices, there’s a lot of cool stuff to be done in the area of autonomous robots. Round 3 of Community Voting has drawn to a close. 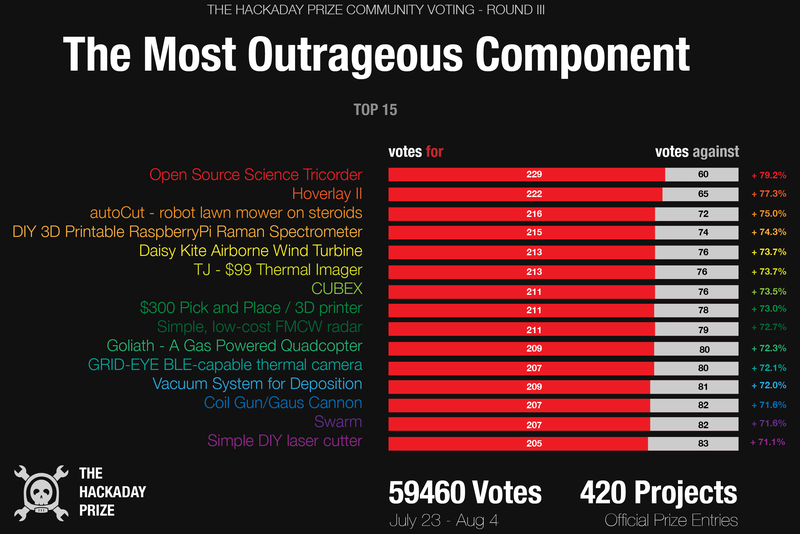 This time around we had nearly 60,000 votes for 420 projects! The first voter lottery drawing didn’t turn up a winner, but on Friday we ended up giving away the bench supply. We’ll cover the projects with the top votes in just a moment, but first let’s take a look at the voter lottery prize for the new round. You must vote at least once in this new round to be eligible for the voter lottery on Friday! We’ve got so many prizes in the package for the fourth round of Astronaut or Not that we’re just showing you a few in this image. On Friday morning we’ll be drawing a random number and checking it against the Hacker profiles on Hackaday.io. If that person has voted in this current round, they win. If not, they’ll be kicking themselves (emptyhandedly) for not taking part in the festivities. We have some of the Internet’s hacking elite judging The Hackaday Prize, and that means they can’t enter any projects into the prize. All the better for everyone else, we suppose. One of the judges, [Sprite_tm], is a resourceful guy and when it comes to judging the entries for The Hackaday Prize, he’s going to do what comes naturally to him: build a machine to automate the task. [Sprite]’s plan for the JudgeTron 9001 is to use neural networks embedded in biological specimens to do the judging for him. Honestly, we really appreciate the effort he put in to this; biohacking is really in vogue right now, and we do love the classic throwback to the AI renaissance here. It certainly doesn’t hurt that he’s using a Raspberry Pi and an Arduino for this project, either. Grabbing a touchscreen LCD and a few other parts out of his junk drawer, [Sprite] quickly whipped up a project that would display entries to The Hackaday Prize to the biologically embedded neural nets. These nets needed a little bit of encouragement to select winning entries, so a ‘feed’ back mechanism was laser cut out of acrylic, mounted to a servo, and filled with positive reinforcement. The software running on the Pi crawls through the list of entries to The Hackaday Prize, extracting images from each one. The plan was for the biological neural nets to select winning entries and be rewarded via the feedback mechanism. These neural nets proved to be very sensitive to the sound of the servo gears of the feedback mechanism, and [Sprite]’s attempt at finding a winning entry with his creation has so far proved unsuccessful. Still, there’s a video of it in action, you can check that out below. Ask Hackaday: What Can Save RadioShack? The news for RadioShack is not good. The retail chain that we hackers hold near and dear to our hearts is in financial trouble, and could go under next year. With just 64 million in cash on hand, it literally does not have enough capital to close the 1,100 stores it planned to in March of this year. On May 27th, 2011, we asked you what RadioShack could do to cater to our community. They listened. Most of their retail stores now carry an assortment of Arduino shields, the under appreciated Parallax (why? ), and even El Wire. Thanks to you. You made this happen. Today, we are asking you again. But not for what RadioShack can do better. We’re asking what they can do to survive. To live. It makes no sense for RadioShack to compete in the brutal cell phone/tablet market, and makes every bit of sense for them take advantage of the rapidly growing hacker/builder/maker what-ever-you-want-to-call-us community. Let’s face it. We’re everywhere and our numbers are growing. From 3D printers to drones, the evidence is undeniable. With 5,000 retail stores across the USA, they are in a perfect position to change their business model to a hacker friendly one. Imagine a RadioShack down the road that stocked PICs, ARMs, Atmels, stepper motors, drivers, sensors, filament….like a Sparkfun retail store. Imagine the ability to just drive a few miles and buy whatever you needed. Would you pay a premium? Would you pay a little extra to have it now? I bet you would. Now it’s time to speak up. Let your voices be heard. Let’s get the attention of the RadioShack board. You’ve done it before. It’s time to do it again. Hackers unite! Early this year, Twitch Plays Pokemon, a webstream of tens of thousands of people playing the same game of Pokemon via web chat. It was certainly an interesting sociological phenomenon, but as in any system where thousands of people try to do a single thing, progress was exceedingly slow at points. This was compounded by the fact the Twitch stream delayed the chat by about 30 seconds. At the time, there was some talk about setting up an alternative to the emulator-based Twitch stream. Ideas were floated, but until now, no one has yet come up with a workable solution. Now we have Pokáde: real Pokemon games (Red and Blue) running on real hardware (two Super Game Boys, two super Nintendos, and two Game Genies), streamed live to the Internet with an IRC-like chat function. Simply for the ease of capturing the video of the stream, [Johannes], the guy behind all of this, is using a pair of Super Nintendos and Super Game Boys connected to USB video capture dongles. The Super Game Boys are modded to enable trading between the Red and Blue versions of the game, and controls are handled with a USB connection to the PC running the server. 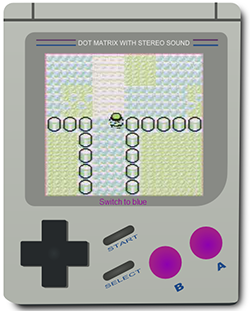 Anyone can play the game, simply by going to the Pokáde Chat, entering the chat, and clicking on random buttons on the brick Game Boy GUI. The game ROMs have been slightly modified to disable the option of starting a new game, but this is still the classic Twitch Plays Pokemon experience: people all around the globe mashing buttons and creating a religion around a fossil pokemon.